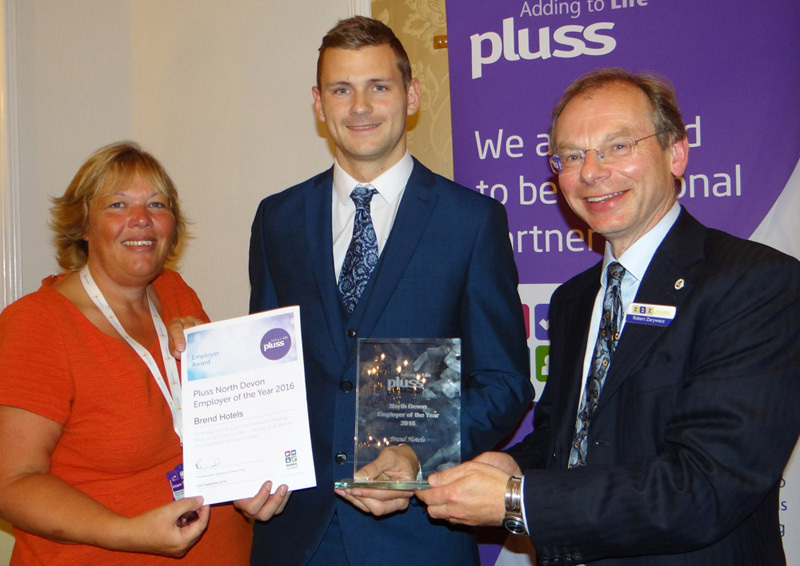 Robert Zarywacz was delighted to be invited by Pluss, which supports people with disabilities into employment, to present its Employer of the Year Award in his capacity as Business Editor of the North Devon Journal. Robert is pictured (right) presenting the award to winner Ryan Brend of Brend Hotels with Marise Mackie, cluster manager at Pluss. Lately I seem to have spent too much time in business meetings and on committees, discussing and making plans. Planning takes place inside our heads, a comfortable environment where we control the results: A leads to B, which leads to our goal of C. Once we take a plan out of our heads and put it into the real world, F, G, H and Q can intervene, some of them completely unexpected. It’s much safer to run a plan in our heads than risk it all going wrong when put into action, but this means we won’t achieve our objectives. I’ve never been happy just to sit on committees as I like to see action. So that’s my focus at the moment: getting plans out of my head and into the real world to achieve what I want and maybe encounter adventures along the way. Not knowing what to expect, I bowled along on Wednesday 25th March and, after a welcome cup of tea in the staff room, my fellow business partners and I were ushered into the assembly of 300 (I think) where the timetable for the day was explained. Next we were assigned to classes where we assisted groups of pupils in meeting the challenge of developing a new range of greetings cards, which included budgeting for production, calculating profit, designing, producing and advertising the cards. There were many creative ideas flying around, as well as lots of glue and glitter. It was interesting for me, with my marketing sector experience, to see how the pupils viewed the different tasks they had to complete simultaneously: team leadership, card and balloon design, advertising and budgeting. When you handle these in your business every day, it’s easy to forget that you had to learn these skills and disciplines just as the pupils were doing. A fair bit of prompting was needed to switch the focus from the glue and glitter to the accounting sheets on which they had to work out how many cards they would produce with their budget and how much profit they would generate. Each group presented its card, banner and balloon designs to the rest of the class with an explanation of the reasoning behind the range and how they had spent their budget. The winning group from each of the 11 forms then went on to present to the whole year with the five business partner judges watching X-Factor style from behind a table. It was a tough job judging as there were some very original ideas and it was a shame that a certain amount of shyness held back some of the original enthusiasm that went into each of the projects. Think about it: how confident would you be presenting to an ultra-critical audience of 300 12-year-olds? The scream as the winning team was announced was ear-piercing and it was impossible not to share their excitement. Children and young people are the future of business and I was deeply impressed by the creativity, energy and enthusiasm they exhibited. Innovation is a key quality for business and so it was heartening to see not only ideas but action as pupils prepared their card designs and explained their reasoning. It’s all too easy for business to criticise schools and colleges and I found the day challenged my pre-conceptions and taught me a thing or two. The enthusiasm of the teachers, the discipline employed and the pupils’ behaviour were all a credit to the college. My own belief is that a broad education is essential for innovation – the mind is its own creature and creates ideas from many sources – so giving pupils a flavour of business can’t be a bad thing. Would I encourage other businesses to get involved? Yes. I’d like to thank the staff and pupils of Bideford College for giving me such a warm welcome. Yes, things look bad, so are we going to #fightback? While leading bankers are described by MPs as being in denial, business owners don’t have the luxury of being able to ignore the consequences of day-to-day economic events. And, yes, there is a lot that is grim, but there are also opportunities. Any business that refuses to see them might as well give up now, because full economic recovery will require relentless effort for some time and it will be businesses, not politicians, who achieve it. In October I commented on the BBC’s now-famous financial crisis logo with its plunging arrow-head. Coincidentally, when poking around the BBC news site recently I could not find any of these gloomy graphics. Does this mean the BBC recognises it over-stepped the mark and that it had become part of the crisis-generating machine? Annoyance with our national broadcaster is obviously quite widespread and the Ipswich Evening Star has started its own ‘fightback’ campaign with a cheeky take on the BBC’s logos. Will it achieve anything? Who knows? Anyway, the paper has made its fightback logo available at its web site for businesses wanting to use it. There’s also a campaign to highlight positive business news on twitter using the #fightback hashtag. It’ll take a lot more than logos and slogans to achieve recovery, but perhaps they can start to compensate for the barrage of gloominess for those of us who have to get on and do the work. If you’re not sure about how to use social media for business – web sites and services such as twitter, LinkedIn and ecademy – today we were commissioned by a new client partly as a result of blogging. Getting the mix of personal and business right is important, as people dislike blatant sales messages but also want to be reassured that a supplier they use is professional. We generate most of our business through our web sites and it is good to see that both our business and personal blogging is reinforcing this. Remember that many social media services are free or offer free entry-level membership, so all that you’ll be investing is your time. If you think of it as one more marketing tool to promote your business, it could provide the extra boost you seek to increase business or offset any effects of the downturn.